This is our third activity for exploring adding 1 more. This time we’re using pegs on a peg board. 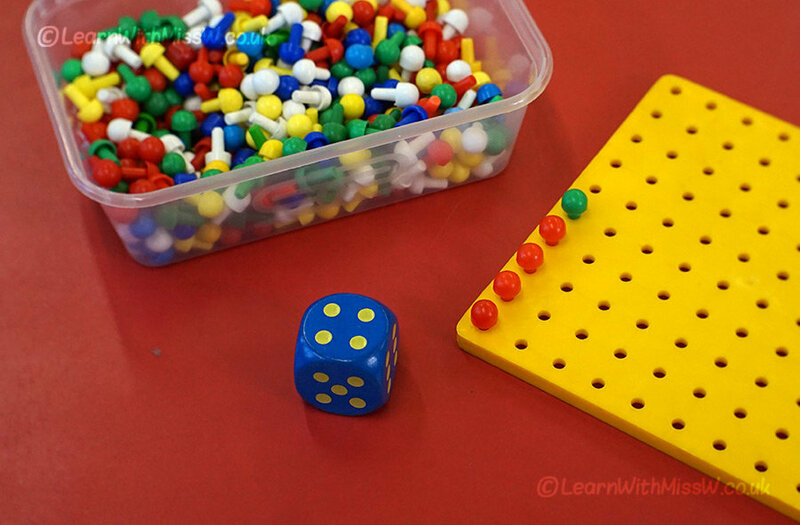 Children use a dice to decide the first addend, put out the correct number and then add 1 more in a different colour. It’s not quite as user friendly as the bead threading because there are more options about how to lay out the sum. Also you can show more that 1 sum at a time, which can be confusing when children show you their finished work. My pupils seemed to manage fine though. Interestingly, some were laying out the first addend in a line while others were choosing to set the pegs out in a numicon-style tens frame arrangement.